Description: BNSF in Big Sky Country. Description: Eastbound Intermodal led by 4 C44-9W's. Description: Foreign Dash-9s' lug Q550 upgrade north of Ideal, GA. 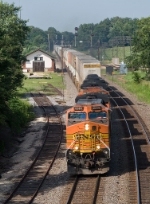 Description: U995, led by an SD70MAC Pumpkin, crosses the diamond at Greenwich, Ohio. Description: Trailing unit on U995. Description: An eastbound BNSF "baretable" wheels past the new Edelstein Connection with the UP's former CNW Peoria Branch. Description: Due to a derailment on the Chillicothe Sub on 7/7, a few intermodel trains are plying the rails of the Mendota Sub on this warm Sunday afternoon. Description: BNSF SD70ACe 9256 blasts through South Joan headed for Madison, TRRA Yard. Description: All waiting for action! Title: BNSF 4044 Yard power sitting around! Description: Power sitting in galesburg waiting to be called on there next train.